Models in CyberPower’s Switched PDU Series provide network-grade power distribution, remote/local monitoring, and outlet control. A Switched PDU allows for remote management, monitoring of PDU vitals, and control of outlets and networked clients. Power status can be monitored over the network, using the CyberPower Management Console and the RJ45 Ethernet port, or locally by using the digital LCD meter. With the CyberPower Management Console, PDU outlets can be switched on and off to remotely reboot connected equipment. Also, planned power cycling of attached equipment can occur without disrupting performance. 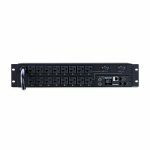 Features of the Switched PDU Series include upgradeable firmware, SNMP network interface, durable metal housing, and horizontal/vertical mounting. Switched PDUs have a switch-free design, network-grade plugs and outlets, a power cord, and a cord retention tray. Every Switched PDU comes with a Three-Year Limited Warranty.